This is a fantastic home that has unsurpassed ocean sunset views. Located in a quiet upscale neighborhood on the Walua bike and walking path just minutes from downtown Kona. Above the heat at approximately five hundred foot elevation where the cool breezes create a perfect climate. The center of the home features a great open space of living and dining with bedrooms located at both ends of the common area, great full multiple couples wanting privacy. Fantastic views are seen from kitchen, living room, master and bedroom two. Newly upgrade kitchen includes, bamboo cabinets, granite counters, tile floors and new appliances. Newly remodeled full length lanai completely furnished with additional table and chairs for out-door dining, futon, deck chairs and bistro set for all day enjoyment. Large master suite in island decor with private lanai, includes a solid mahogany four post king size bed, flat screen t v, new large custom tile walk-in shower and granite counter sink. Bedroom two is Asian decor complete with a solid teak queen size opium bed and private entrance to the lanai. Bedroom three has bamboo decor with two twin beds that can be made into one king. Large private pool with fully landscaped grounds makes this paradise. This is a very clean and comfortable home. Sit back and watch the palms sway in the sunset or take a snooze to the sound of exotic birds singing. I am a licensed Real estate broker in California and Hawaii. I enjoy four wheeling, quad riding, hiking and other out door activities. While in Hawaii it's all about relaxing on those out of the way beaches, hicking the Volcano and exploring the unlimited sites. It has become the only place that I can get away from it all and truly relax. 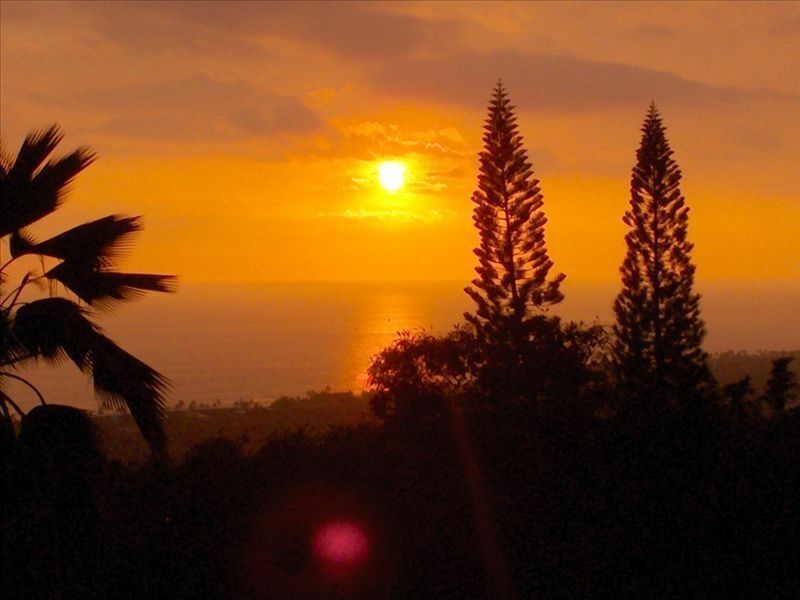 Hawaii, Kona, beaches, sunsets and the perfect temperature. What else is there? Peace, tranquility, the ease of coming and going when I please and of course I never tire of those wonderful sunsets. Fully remodeled master bath has large granite counter and walk-in shower and out-door shower. Guest bath is shower over tub. This is called the Sunset house for a reason. They are fantastic! Solid Teak Table sit six. Plus outside lani table also seats six. Lots of books to read or take with you. This home is all one level, however the pool is located down the outside steps in the lower yard. We have tried to provide everything to make your stay an un-forgetable one. Please notify us if you have special needs. This was our 7th trip to the Big Island and it was by far the best place we have stayed. The house is well equipped, quiet, and comfortable. The pool, very enjoyable. Had one issue that was addressed timely and satisfactorily. I believe this property is one of the best values to be found in the Kona area. It's not oceanfront, but it has a fantastic view from the lanai. Be aware, you may hear a rooster very early in the morning. However, if you've been to Hawaii before, you know that chickens are just a part of being there. Of all the places we have stayed, this is the first place we've said, "We'll be back!" Once again we found the house clean and comfortable. The sunsets from the Lani are incredible. The locals talk about the Green Flash, after ten years of sun breaks in Kailua-Kona we finally saw the Green Flash, amazing. From the Lani watch whales spout in the ocean below, enjoy you meals and read a good book. Enjoy the pool after you tire of racing around the island to see all of the sites. Plenty of beaches close although our favorite is Hapuna, 45 minutes from the house. Full service, bathrooms, showers, life guards and picnic areas. Pack a lunch and go early it gets crowded. If you go to Hapuna drive 3 miles further to Kawaihae to the HaleI'A Da Fish House. They have the best fresh fish from the local fishermen you will ever eat, check it out on yelp. Expensive, you bet, all food is expensive in Hawaii. We mostly cook at the house, although have a few favorites, Frenchmen's Cafe, Da Poke Shack and for Hawaiian food Kaaloa's Super Js. All mom & pop shops worthy of a visit. Did I mention the property manager lives across the street, Chris a great guy. The house was great, well maintained and clean. Pros: Location was excellent , as was the view from deck. Comfortable bedrooms and well equipped kitchen. Cons: Open bathroom and toilet in master bedroom. Pool was too cold to use at all. Our first impression of the house was that pictures do not do the place justice!!! The area was spacious and comfertable. We were amazed at the size of the lanai and the sunset view when we first arrived. Being able to watch the sunset everyday was amazing. Location was great only 10 mins from great restaurants and shops in Kailua-kona. Great place to stay would highly recommend giving this property a look!!! Beautifully maintained, spotlessly clean. So peaceful and relaxing. Unforgettable views and sunsets. We so enjoyed our stay here. Myself, husband and my 2 college age children were only on Kona for 4 nights and had to force ourselves to leave this beautiful house to go and explore the Big Island. I could have very happily sat on the Lanai with my book for the entire time. The views were amazing, When we did venture out I made sure we were back each day to watch the incredible sunsets. The house was so clean and very well maintained, we had everything we needed. We loved the pool, again it was clean and the gardens surrounding it were so well manicured that in itself was a pleasure to look at. There was certainly plenty of room for us all to be in our own space. We were away from the crowds down in the town but then only a short drive to restaurants and shopping. We did get to Volcano National Park though it was only partially open due to the Government shutdown / recent volcanic activity. We also explored nearby coffee plantations and the beautiful beaches to the north of Kona. I hope we will be able to return to the Islands of Hawaii if we do I would for sure try to stay in the Kona Sunset house. FYI The owner responded to my e-mail in which I had one quick question very promptly. We had a wonderful Christmas vacation at the Sunset house. The house is very clean and comfortable. The grounds are amazing....even better than the pictures suggest. The sunsets from the lanai are truly spectacular. We were busy on the island each day, but made sure to be back in time for those sunsets! The location is very convenient in Kona, but away from the "tourist strip" at the same time. Our kids loved the pool and the game cabinet...we never turned on the TV. Thank you to the owner for sharing this amazing property. We look forward to returning someday soon. This property is located in the heart of Kona on the Walua bike path. It is close to everything and the bike path is great for early morning strolls. The rates posted are general rates and we do not charge for children under the age of two years. Our rates are based on number of guests and nights stayed. Some discounts can be applied for reservations exceeding 21 days.